I've been overspending massively lately - like really, really bad. SO I'm trying to cut costs a little by bulk making meals - for both lunch and dinner. Over recent months I have become obsessed with kale, tahini, lemon dressings and anything relatively 'fresh' tasting and light. I've also become really into salads again. Salads have the stigma attached to them of being boring, just lettuce or not very appetising. Well, let me tell all those salad haters - you haven't had one of my salads. I never make a boring salad, not blowing my own trumpet here, but I don't. Yes sometimes they are heavy on the lettuce and tomatoes with some cucumber thrown in there but add a bit of feta, or hummus...some sundried tomatoes, some quinoa - you can make a salad into a tasty lunch or dinner treat. Carrying on with my theme of kale-lovin' is this beauty of a recipe I've got for you here. It's PERFECT for lunch with the warmer weather coming up or even for a lighter evening meal. The potatoes, tahini and lemon dressing all need sea salt and black cracked pepper to season. 1. First things first, preheat your oven 180 (fan assisted) and line a small baking tray with foil. Boil your cubed sweet potatoes for 20-30 minutes before draining and popping onto your baking tray, drizzling with oil and season with salt and pepper. These need to be baked in the oven for 15-20 minutes once it's heated. 2. While the potatoes are cooking, prepare your dressings - grab a bowl and mix the crushed garlic, tahini, lemon and chopped parsley. Add the water a tablespoon at a time. The consistency should be slightly runny - think 'drizzle'. Season with salt and pepper. 3. In a separate small bowl, mix together the lemon juice, olive oil and seasoning. Add a sprinkle of chilli flakes. Mix the chickpeas in the lemon dressing and set aside. 4. Cook your quinoa in double the amount of water (2 cups) on a low heat in a saucepan. Stir every so often - you may need to keep adding a little water every now and then. I usually cook quinoa for around 15 minutes. 5. 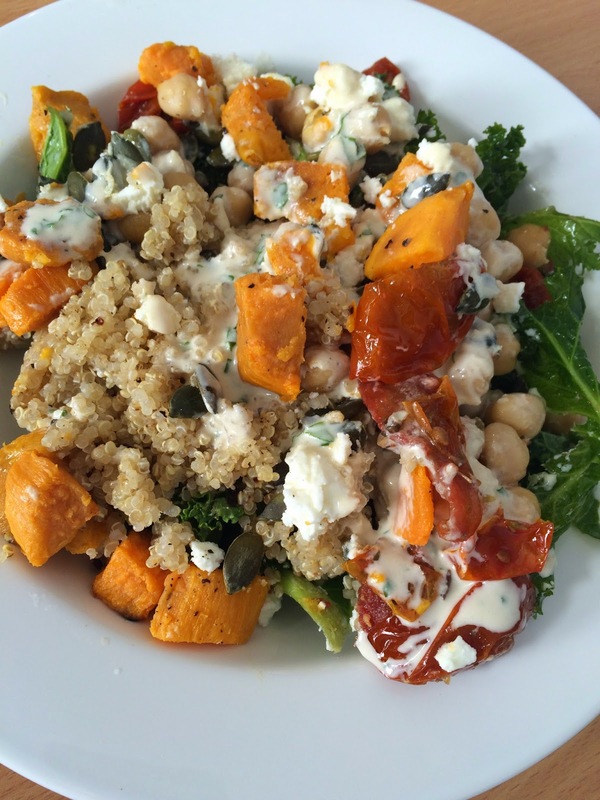 In a large bowl, pop the kale in and tip over the chickpeas and lemon dressing. mix together so the kale is coated. 6. 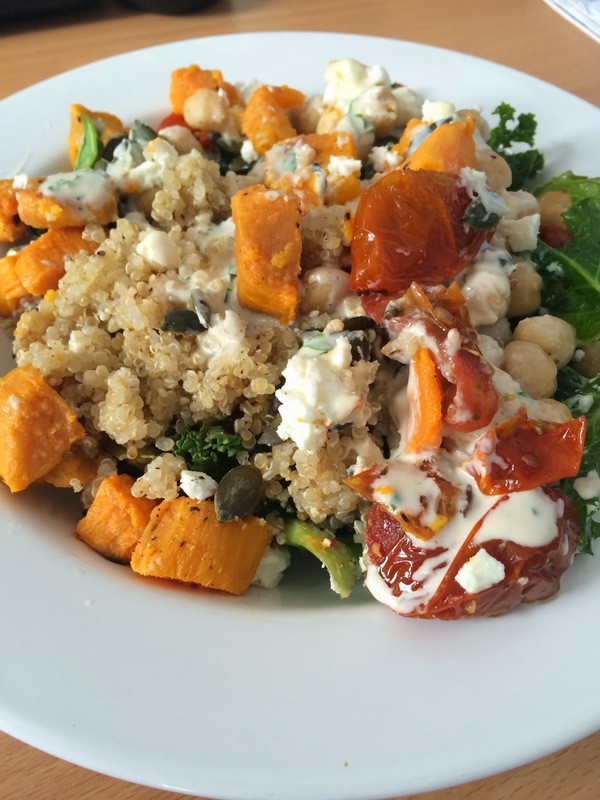 Grab your serving plates/bowls and layer - kale and chickpeas first, a little quinoa, sprinkle with sweet potatoes, crumbled feta, sundried tomatoes and sunflower seeds. 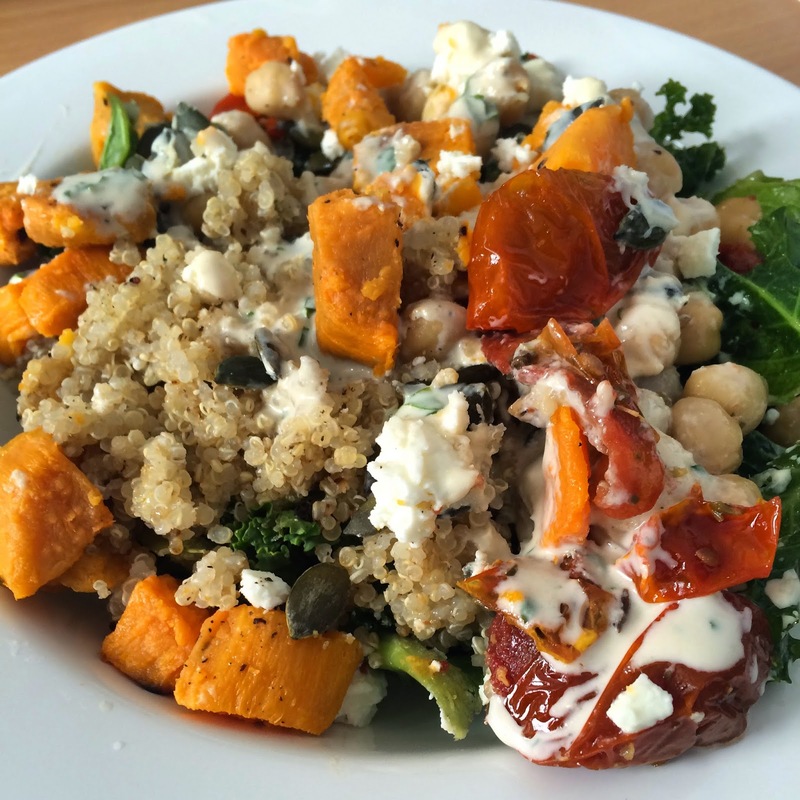 Finish off by drizzling your tahini dressing over - you can also serve this on the side. If you're taking to work/uni/school, do the same construction but in tuppaware/a sandwich box. You could also do this with spinach but it would be quite wilted by the time you get to lunchtime if you're making it ahead. The joy of kale is that it does not completely soak up the dressing, resulting in soggy kale! It really is a perfect lunch. I've eaten it three times this week and am eagerly anticipating tomorrows helping already! Yum! This looks so goooood.